As you might know, I spent time this past month working on what I nicknamed "The Andy Project". The idea was to re-create some of Andy Warhol's art pieces on an Amiga, well, an emulated Amiga, using appropriate tools, as pixel-accurately as possible. This blog post will be a summary of results, mentions of pitfalls, and that kind of thing. The previous three blog posts cover most of the other information for the project. Links for these are on the bottom of this post. This actually got me thinking a lot about the resulting media files that I will be produced. These will be virtually indistinguishable from the originals. Are they the same as the originals? 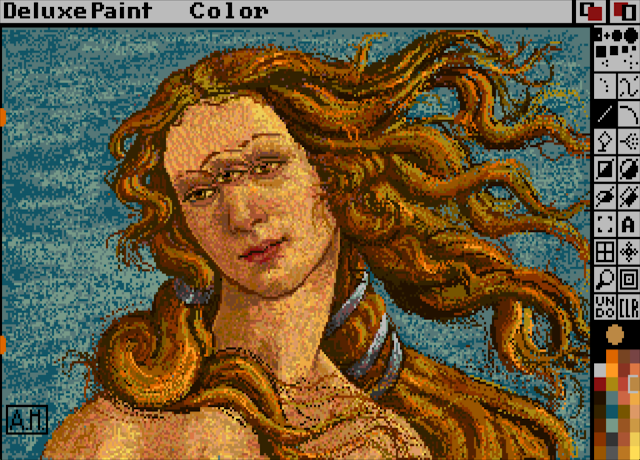 In some of these, I am the person who drew all of the individual pixels in Deluxe Paint. It is distinctly not the original files, which are still under lock-and-key. But those may surface, and you may find that mine are nearly identical with respect to which color pixels are where on the digital canvas. In the music industry, if you were to make a copy of a waveform, by looking at numerical representations of the wave, and typing them in to a computer, making a replica of the original waveform. When played back, it's still Debbie Harry's "Rush Rush"... but you actually created it from scratch by copying the numbers from the original. It's a replica... that is functionally and actually identical to the original. In fact, if you were to write a computer program that did this for you; go through the audio file, and look at the numbers, then write those numbers into another file... then the computer has generated a replica of the original... That's exactly the same as I'm doing here, right? That software already exists.. it's "cp", "copy" or "drag-and-drop the icon to another folder." Does that mean that I cannot take credit for my reproductions? This is kind of why I had wanted to add specific mistakes/changes to mine, so even if you were to compare them at the pixel level, mine would be at the least, a derivative work. ... but is that enough? Couldn't Andy's estate come after me and say "that imagery is exactly the same as the original, and you're putting it up online for free! Stop that now!" I know that mine are replicas... perhaps that's enough. But then, if you think about the pop-art movement of the '50s and onward, it delves DIRECTLY into this, head on. 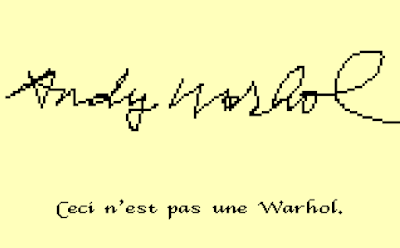 Andy, for example, took iconic things (soup cans, Marilyn Monroe) and used them as the basis for his iconic works. If the Campbell's Soup can looked different, so would have his artwork. Wait.. are mine replicas of his works? Are mine new works, like the originals under the pop-art umbrella? I started out with a list of 11 images to pick from. I thought I might get a few done, but I never set specific goals for myself... so I only got three of them done. I still feel like this is a major success. Mainly because I can now do many of the other ones at my leisure using all of the tools and frameworks I've already set in place, with full knowledge of the pitfalls for the various steps. I also created two pieces that I was inspired to make from the project, so I included those in the ZIP and slideshow ADF as well. Links to the slideshow ADF downloads are at the bottom of this blog post, along with an in-browser emulator that can play it in-browser. Everything provided here is to be considered to be Creative-Commons BY-NC-SA. (Attribution, Non-Commercial, Share-Alike). I think the big thing that went wrong was wrangling with tools. There are two instances that come to mind. 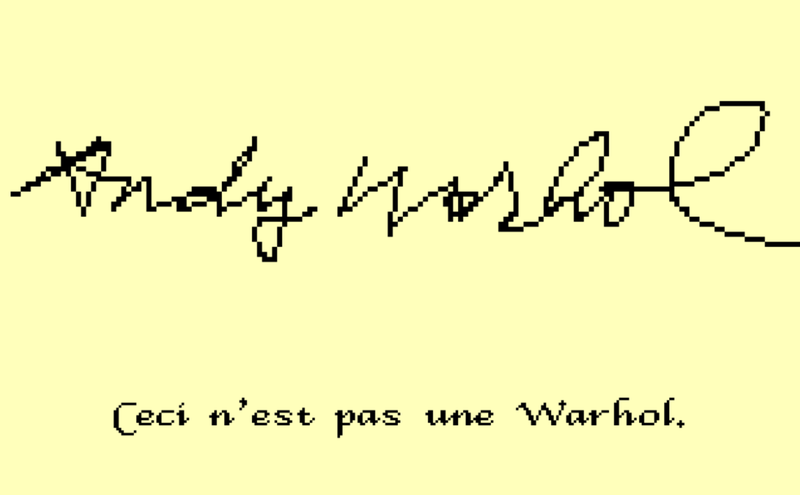 I feel like Andy might have accepted this. If you watch the time lapse, you may see bits like this roll through. This is a fine choice, but I had a problem where... I'm not exactly sure what was going wrong, but I was re-drawing the entire screen every frame. It seemed to be chewing on more RAM that it should, especially after it sits for 5 minutes... especially running in Chrome on a 8 year old mac with 2 gig of RAM. Yes, I see the irony here that I'm creating these images on a machine that could do this with 1/2 megabyte of memory... hehe Anyway, it would get so unresponsive that it would essentially lock up the machine, but it always seemed like it was JUST ABOUT TO wake up. But no... spinny rainbow pizza instead... Force reboots were my friends. The ADF disk image file you have there has all of the above done to it, right? "apply" the changes to the ADF. Can't do this. The change overlay is in a custom format. 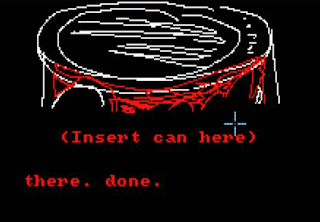 Turn on the UAE emulator flag "writable_floppy_iamges=1", which tells the emulator that it's okay to write directly to disk images for new disks. Then you must mount a new disk, once this is set, diskcopy the content over, and you'll end up with an ADF with all of these changes. Right? At some point in here, I needed to edit the startup-sequence on the ADF, and I couldn't do it via the emulator's mounted-folder-as-disk-image, so i grabbed "Vim" from Fred Fish disk 591. This required ARP for some reason, so I grabbed ARP and ran the installer. It replaced a bunch of AmigaDOS commands, added a library, etc. Make a disk image to a file within the emulated Amiga. Sounds ridiculous, but in fact, yes... it is ridiculous. The only one I found that "should" work in AmigaDOS 1.3 was "TransADF"
Grabbed TransADF off Aminet, put it on my "Work13" disk (which is a mounted folder from my Mac). Fumbled for a while and realized I could boot an emulated AmigaDOS 3.1 system. Booted up AmigaDOS 3.1, ran TransDisk, created the ADF, looked good. Booted back into 1.3, and suddenly, on "loadwb", the system just locked up with a blank blue screen. Eventually traced it back to ARP being an issue. Luckily, my Work13: disk was being maintained by Git, so i just reverted the changes that the ARP installer did... and now it all worked again. blerg. So yeah. Cumbersome as all get out, but I managed to get the ADF made, and I now know I can just boot into 3.1 and run TransDisk to do this again. I got three image replicas done! YAY! I feel super proud of the fact that I was able to do it to the best of my abilities, to the best effort I could provide and do. I tried my best to be pixel-perfect, to be color-accurate, and I think the results paid off really well! You can see me work on these in a time-lapse on YouTube too! What you see here are EXACTLY what I was doing this project to avoid. Incorrect aspect ratio, wrong file format, etc. ;) But they show the effort. I left the Deluxe Paint panels up just for fun, and to show that these are in fact the ones that I made, and not the source Warhol material. If you want the proper files, they're downloadable at the bottom of this file. 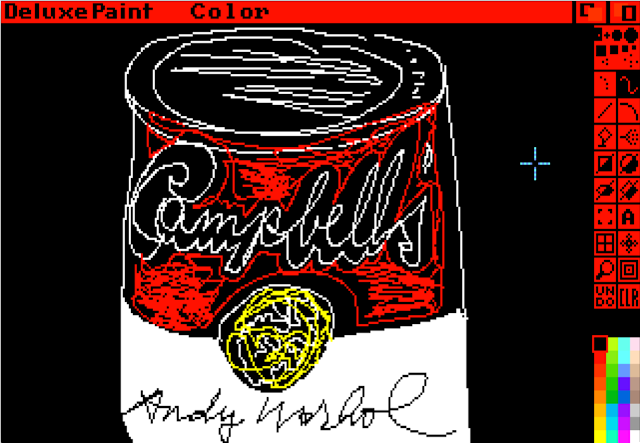 "Campbells" took full advantage of the foray into GraphiCraft, as I used the palette generated from the saved out Graphicraft 1.2 image, but then tweaked by hand to accurately match the pre-release palette that Andy would have had available to him. I feel like this is a great representative pice of his work on the Amiga, as well as for this project itself. I had originally thought that "venus" was going to be pretty simple. It was mostly the "venus.iff" file that is included with every copy of Deluxe Paint. 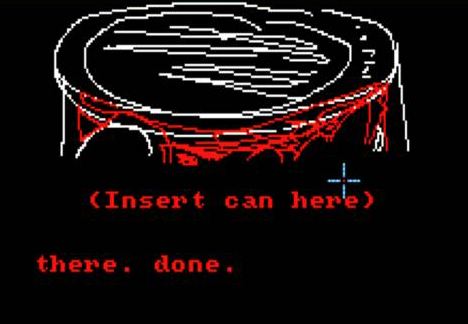 (Here's a link to the original as seen in Deluxe Paint IV.) Well, there's those two orange dots on the left, the scribble on one eye, and the third eye... so it should be easy. Right? Nope. This means that I had to spend time not just picking the right color, but also cross-referencing the pixel in the jpeg with another of the same wrong color, but unchanged by andy... then find THAT color in my DPaint version, and use that color. The forehead. I don't know how... I don't know why, but Andy replaced MOST of the forehead with the version that's there... He probably just grabbed a brush and pasted it down a lot. There's some evidence of this being the case along the left side. Perhaps I'll analyze it more for another blog post in the future. I ended up having to wipe out the entire forehead and re-do it entirely. I do feel it necessary to note that many of the pixels in this are "close".. not specifically the exact correct shade of the colors. There are a lot of orange/browns that are VERY similar and with the process of cross-referencing mentioned above, I know that I made a few mistakes here and there on this one. I had felt a bit uneasy looking at this one for a while, but couldn't place exactly why... but it turned out that the forehead's replacement was a huge subconscious "something's not right here" flag in my head that I couldn't quite place. This one looked like it was going to be fairly straightforward to make... and it in fact was! There were a lot of stepped lines, and the source material was scaled up and fuzzy, but I was able to work around this. I remembered that DPaint has a tool "Coords" (press | to enable) which shows where your cursor is in X and Y, and also length of lines you're drawing. This took was invaluable for doing this replica. 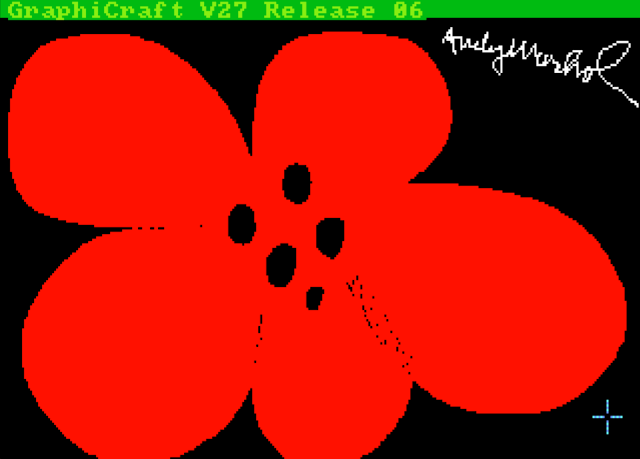 Yes, I did notice that "Flower" and "Campbells" are missing the red rectangles in the upper right of the imagery on the provided ZIP and ADF files below.. Those are the screen raise/lower tools from AmigaDOS shining through. Much like the "GraphiCraft" drag bar being visible, those should also have been visible. That's my mistake. The next version I cut of the slideshow will have that fixed.